Bayshore in Daytona Beach is a beautiful riverfront condo complex consisting of two residential structures nestled along the ICW. This community offers a wealth of amenities with homes that provide spacious living area and breathtaking river and ocean views. Bayshore is located on such a large amount of acreage, it actually feels more like a park with the lush landscaping that abounds. Some amenities here include tennis courts, billiard room, direct riverfront pool, outdoor grill, sauna, club room, and a fishing pier/dock on the Halifax River. Residents find comfort and privacy with the secured underground parking and on-site management. These condos are ideal for retirees, second home owners, or students in search of maintenance-free living. 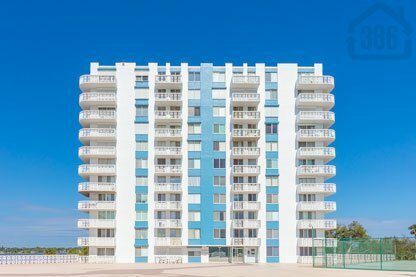 Call us today to find the perfect home for you in Bayshore, or any other Daytona Beach area condo property. Breathtaking Million Dollar $$ Views Of The Atlantic Ocean & The Halifax River From This 11th Floor 2 Bedroom, 2 Bath Convertible Condo. Very Open Floor Plan! Furnished Or Unfurnished. Seller Will Remove Furniture If Buyer Prefers.